Enigmatic Rambles: What's on the side of my bath? 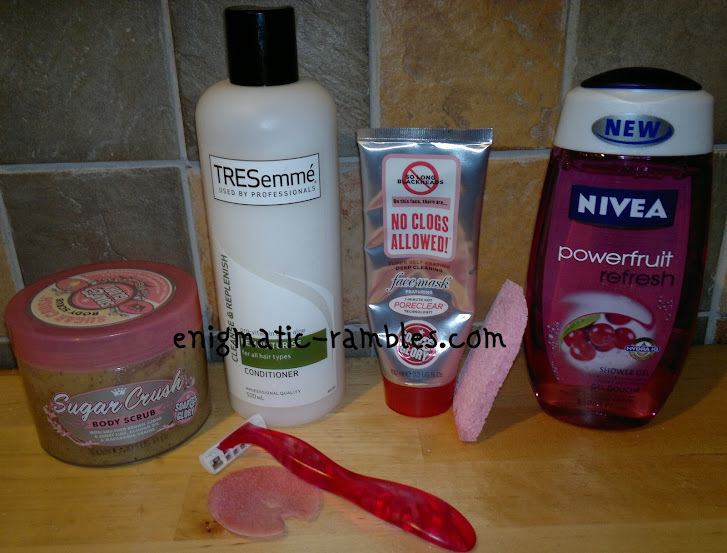 This may seem random but I have seen lots of whats in my shower posts, I thought I would share what is on the side of my bath as I do like to indulge in a bath once or twice a month. I use different things in the shower than in the bath and this is what I usually use. Soap and Glory Sugar Crush Body Scrub - Got to get rid of the winter skin ready for the spring / summer! This smells amazing and leaves my skin feeling so soft and smooth. I use the scrub before shaving and it does help avoid ingrown hairs. Lush Shampoo Bar Irresistible Bliss - review - This comes in the shower too, I like shampoo bars as they last so long. This one is on its last legs now though. TRESemmé Conditioner - I use two conditioners when in the bath, I use Aussie Reconstructor as a mask and then after the shampoo I use a normal conditioner. Using this one and I don't mind it. Face Mask - Soap and Glory No Clogs Allowed. I always use a face mask while in the bath, at the moment it happens to be this one by Soap and Glory. I am particularly enjoying its heating up technology as it is freezing here in the UK at the moment. Finally a shower gel, I have recently finished using one by Sanctuary and am now using this one by Nivea. Smells nice and does its job well.